Starcraft is one of my favourite games. I want to give a brief (1193 word) overview of my life of Starcraft. There is much more I could say about specific events, players I used to play with, clans, personalities and professional players I have followed in the game, but for now I will stick to a brief overview of my Starcraft journey. People who know me used to ask why I play Starcraft so much and what was it about the game which was so compelling to me. No matter how hard I tried, I could never find the right words to describe just how much the game meant to me. A modern Starcraft 2 player known as ‘Winter’ made this short film to describe what the game means to him and I wish I had something like this to share back then. My Starcraft life started when was 12 during 1998. I was privileged enough to have access to a family owned desktop computer and had enough pocket money to save up and buy the occasional PC magazine which usually featured a CD containing software and game demos. One such CD contained a demo for Starcraft, enabling me to play 3 short single player missions. I instantly liked the game and I literally played the demo over and over again until I was given the full game, possibly for my birthday. For months I played through the single player Terran campaign, creating new saves and trying to better my scores each time. I even got the ‘Official Prima Strategy Guide’ for the game which I still have to this day. Eventually I would try multiplayer but I must remind readers this was 1998, there was no broadband internet, there was only dial up modems which would engage the telephone line. Mobile telephones were also rather uncommon at that stage which meant there was the occasional family argument over internet and telephone line usage. After downloading a patch which probably took close to an hour (I am not exaggerating) I started to play games online. The computer I was using was bought around 1996 and was already vastly out of date with probably a 28.8k modem and bare minimal memory. Suffice to say there was a lot of latency which resulted in me disconnecting from the game before it would conclude. Battle.net (version 1) would tell fellow players that I had high latency and would also keep track of my disconnects which meant others were unlikely to want to play games with me. Eventually I gave up and only played against the computer AI (artificial intelligence). In late 2001 the family computer was replaced. It had much more memory and the modem was at least twice the speed with a new, more reliable ISP (internet service provider). For the first time I could confidently play Starcraft games against people online with no latency. At this point I had also introduced the game to several school friends and was able to arrange games after school. I don’t like to brag too much, but at that age in my circle of friends and associates I very rarely found anyone who was better at playing a video game against me. To suddenly find people, online, playing Starcraft who were not only better at the game than me but can completely outplay me was both refreshing and frustrating. Furthermore when I learned that those people who could consistently outplay me were themselves completely outplayed by others really blew my mind. I learned about WCG (world cyber games) and the Team Liquid website which has been source of Starcraft news, replays, schedules and more for many years now. Following this was what I can only describe as an explosion in South Korea from which I believe, esports was born. Entire generations in that country fell in love with the game just as I did some 5,500 miles away and pushed the very boundaries of what was possible within the game. Tournaments were formed, followed by sponsored leagues, 24 hour television channels, celebrity players and casters. I honestly felt and to some degree still feel that I was born in the wrong country, that South Korea was where I needed to be. I found a short documentary which really highlights how Starcraft began in South Korea. By watching replays of superior, often Korean players, I started to get pretty good at the game, no where near the level shown regularly in Korea, but certainly good enough to be able to beat anybody new to the game and maybe half of the European Starcraft community. I spent a lot of time searching for Starcraft resources, translated news, bits of Korean television. Try to remember, back then there was no youtube, there was no such thing as streaming and hardly anybody had broadband internet, gaming online was a completely different experience to what it is now. In either 2002 or 2003 I was given my own computer and, better yet, cable broadband was installed where I lived which meant for the first time I could use fast speed internet anytime I wanted in the privacy of my bedroom. It was sheer bliss and my Starcraft career took a new turn, but not necessarily for the better. Spending all day and often all night playing and studying the game with a community of online friends took a heavy toll on my life outside of the game. I was an apprentice, working for a local ISP but would often show up to work late, I didn’t complete my course work or take advantage of the opportunities working for an ISP presented. This unhealthy lifestyle took its toll within the game as well and I became quite unhappy, it was one thing to not achieve goals outside of my digital life, but to fail within Starcraft as well was shattering. I became bitter and angry which in turn had an affect on my relationships both inside and outside of the game. Eventually I stopped playing but carried on keeping an eye on the Starcraft scene for years to come. 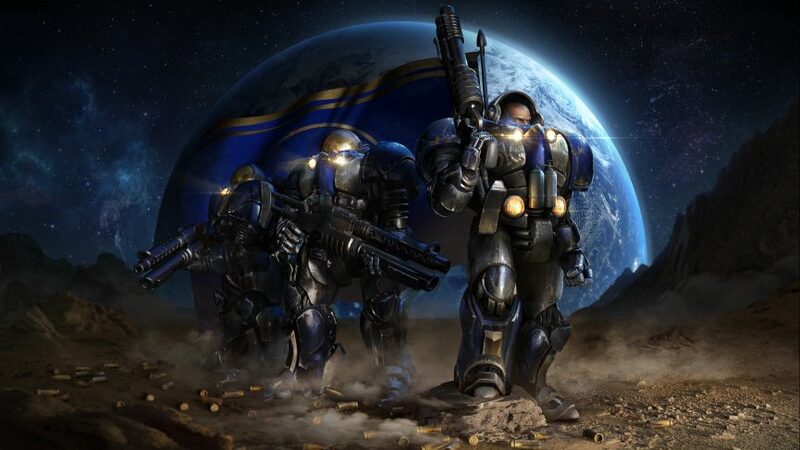 It would not be until the summer of 2010 when after a long wait, Starcraft II was released followed by two expansions, Heart of the Swarm and Legacy of the Void. I of course bought the game immediately. For me, this time around was very different. I have played very few, 1369 to date, ladder/PvP (player vs player) games and have to date not even tried to get good at the game. I think it comes down to something known as ladder anxiety, something I only really heard about when I wanted to establish why I had such difficulty in hitting that play button. I have at least continued to follow the esports events and have recently written about the WCS (World Championship Series) 2018 Global Finals. Because of these anxiety issues, I have a love hate relationship with Starcraft 2 which I hope someday I will overcome. If there are any readers out there who would like to try playing Starcraft 2 with me, even if just trying the co-op mode, please contact me. I would also love to hear from anybody who has a Starcraft journey of their own to tell. If you liked this page, please consider sharing.